The very idea of a pickled bologna leaves me giddy. I've never eaten it, but it has to be good. Apprently a thing Michiganders eat from a jar with beer. So I decided to make it. Of course utterly from scratch. These babies up front are several pounds each. I honestly don't know how people made proper mortadella before the advent of machines. I beat the flesh for nearly an hour with a wooden bat. Seriously. And it was definitely smooth, but not utterly emulsified. Maybe it never was in the past. IT's close enough, I hope. One is in a half a bung the other in a beef middle. Very mildly spiced. I am going to let them hang just for a few days. Then cold smoke. Then lightly poach. Then submerge in a briney vinegar with spices. To be eaten cold and sliced. If that doesn't sound divine, I don't know what possibly could. OK, on sourdough with mustard. Rock On Bologna! As a food historian and potter I have been thinking a great deal lately about the sthape and form of eating utensils and serving vessels. They change dramatically over time and from place to place. There's a chapter on this in my Three World Cuisines textbook and I even asked a related question on a midterm exam I was grading today. That is, why do different cultures use different cutlery, seating arrangements, dishes and how does that affect the cuisine, its flavor, texture and consistency? So when the company that makes this asked me to review the OBOL I naturally said sure. Now just to preface my remarks: I am not at all against innovation and evolution of eating paraphrenalia. In fact I adore my set of knorks. They are beautiful, well balanced and eminently well engineered. Nor do I bewail the proliferation of finger foods and things eaten with hands. I prefer to eat with my hands for the sheer sensual pleasure of doing so. So the Obol arrived in the mail today with much fanfare. My 15 year old son immediately volunteered to test it with frosted flakes or some such crap. The whole idea is that the cereal stays dry and the milk is below. You scoop the cereal into the milk as you go, No Sog. The idea is ingenious. My son said in terms of sheer engineering it is a marvel. Revolutionary! But then I thought, would I want to eat anything out of a blue bowl? With a spoon that looks like a baby rattle? From a bowl that is cheap plastic, however well balanced? I don't think I can do it. If this were clay, wood, even metal, in warm appealing tone, I might get really excited. It so reminds me of what we used to feed my sons when they were babies, that I don't think I could bring myself to eat out of it without nausea. Final score 15 year old: 10. 47 year old: 0. I guess you now know your market folks. You know, I've written about these. Mused on the name for hours of personal entertainment. It means 4-sided noisy fruit. Dreamed about all the things I'd do with them if I went to Thailand. But until recently I had never set eyes on one. Until they show up in the farmers market. The farmer told me his dad brought the seeds and has been trying to grow them for years and finally they bore enough to sell. Some were stir fried the others are being pickled. Where else could this happen but in Stockfish CA? Hey Folks, Feeling like a book giveaway. 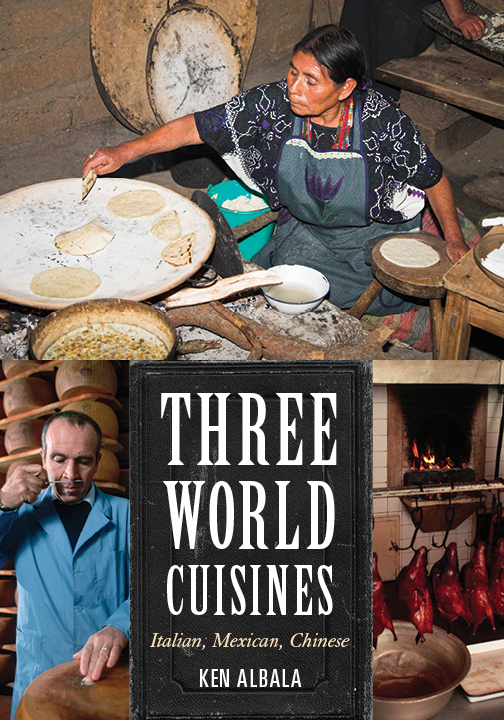 This time it's my new textbook Three World Cuisines: Italian, Mexican, Chinese. It's a bit of food history and anthropology, a bit on cooking technology and utensils, ingredients and plenty of neat recipes. 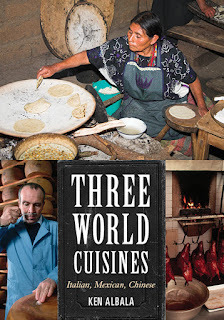 It is essentially an analysis of the ways these three cuisines developed over history and why. Answer this question and I'll send the first person with a complete answer a copy. What is the traditional way to consume hawthorn in China, apart from its medicinal use. 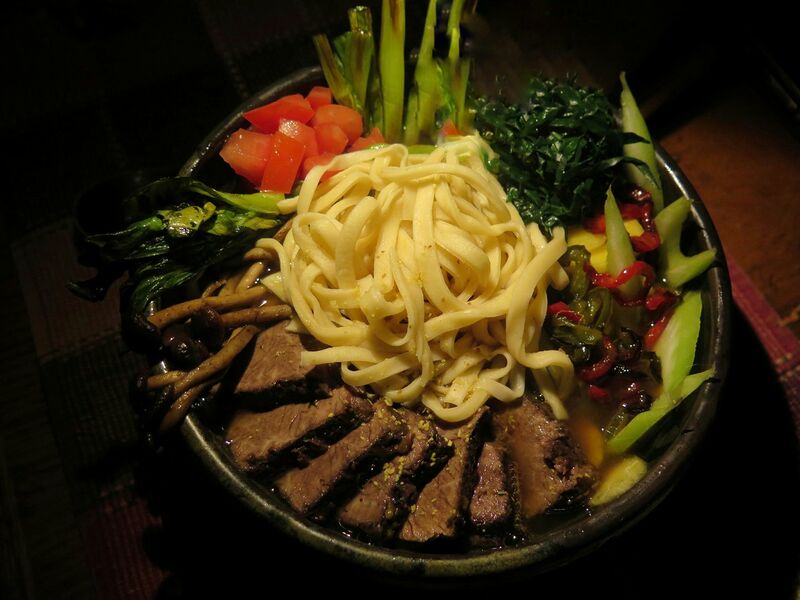 What is this dish called in Chinese and English and why? I finally bought a little oak barrel, something I have been coveting for a long time, which suddenly became affordable online - mind you at the same time a major food magazine starts talking about putting cocktails in barrels. No, we want our own product. Here's the idea: every day pour off a sip to see the effect of what happens to a nice clear Cab-Shiraz blend distilled. After only 5 days look at the color. It smells intensely of butterscotch candy. I mean exactly like Werthers. It's a surprise to taste that it's not sweet. I'll report back in a few weeks, but I expect some amazing things are going to happen day by day. Now if I can only figure out the sour mash, we will be on our way to bourbon. Around this time every year I am usually fermenting grapes from the backyard. But the rats got them before I did, I mean every single grape, before they were ripe. Oh well, I guess they have to eat too. But I did manage to find some bottles of wine from last year and had a pleasant day making absinthe. It is not only local but small batch to a ridiculous degree as you can see. If the wine was about 12% I guess this is not bad for three bottles. It was soaked with dried Artemisia absinthium, which a friend brought me (the only imported ingredient) with herbs from the backyard including southernwood (a close relative), rue, sage, bay, beebalm and fennel. Then distilled. It was the slowest distillation I've ever done, not sure why. Maybe it was all the herbiage. Next to it is the tiniest batch of distilled mead made from 2 lbs of local honey. I'm not sure if anyone on earth does make a honey distillate, and I can certainly understand why they wouldn't. From about 1.5 liters of mead I got a few shots of hooch, which I guess makes sense if it was about 5%.